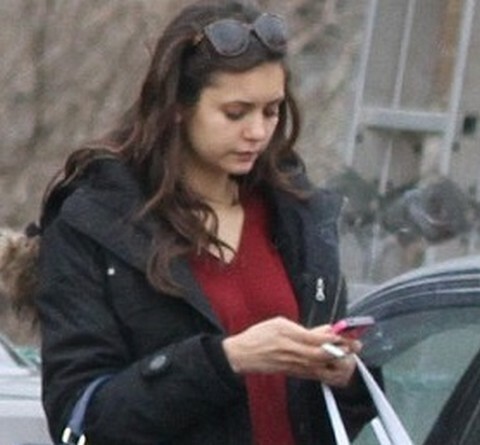 Nina Dobrev, Ian Somerhalder Dating Update: The Vampire Diaries Suffering From Relationship Tension – Trying to Be Friends? Nina Dobrev and Ian Somerhalder are not the biggest fans of their own show, The Vampire Diaries, right now, and it’s impossible to begrudge them a little spite in their situations. How often is that you’re forced to not only work with your ex-boyfriend, but also kiss them and act out romantic scenes with them? Especially months and even years after your breakup? In fact we learned last week that Nina Dobrev is heading over to The Originals for episode 5 on November 3 – could that be to see if she works out well there and then move her off The Vampire Diaries permanently? On the one hand, you could say that Nina Dobrev and Ian Somerhalder should known about the risks and not gone ahead with their dating relationship in the first place – but again, it’s next to impossible to stay completely professional in these situations, and they’ve handled it as well as possible. Well, until recently, that is. Our sources have been telling us about the on-set tension on The Vampire Diaries for quite some time now, and the show’s plot has even changed directions due to Nina’s awkward relationship with her ex-boyfriend, grown more awkward since he started dating Nikki Reed! In an effort to minimize the scenes [especially those of a romantic nature] between Ian’s and Nina’s characters on the show, they’ve created plot points to keep Ian away from Nina for much of Season 6’s beginning and also put Nina back with Paul Wesley’s character by the end of the sixth season. It ain’t because it makes a better story, trust me. I mean, it might, but that wasn’t their sole purpose in doing so. To be fair, we are also hearing that Nina and Ian are trying their absolute best to stay professional and ‘friendly’, even though Ian keeps showing off his new girlfriend, Nikki Reed, every chance he gets. I mean, the poor guy had to put up with Nina’s endless lists of flings from the media, so he’s entitled to a little showing off on his own, right? Maybe not rubbing it in Nina’s face, but at least a little bit of PDA. Unfortunately, that hasn’t lightened the mood between them at ALL [shocker, I know], so we’re right back where we started. Seriously folks, don’t expect to see the show come back for the seventh season with Nina and Ian both signing on for another few seasons. Nina Dobrev & Ian Somerhalder Split: Nina Falling To Pieces, Ian Ready to Forget about Her! Nina Dobrev and Matt Davis Next Vampire Diaries Love Couple – Will They Start Dating?